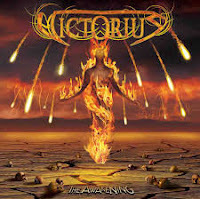 Victorius - underground metal heores from Germany and just recently signed to SPV/Steamhammer. This young up and coming five-piece are out to cause an wave of positivity and melody. Opening track, "Age Of Tyranny", breaks the speed of light with rather typical but oh-so catchy melodic power metal. "Starfire", the following title track, "The Awakening", and "Land Of Hope", shockfull of melodies and hooks in the vein of the first couple of albums with AXXIS. Very catchy and bombastic stuff and so bright I had to wear me shades while listening to these numbers. You could literally hear them shouting... 'Bono you tw@'. Forget about the insane pace of Dragonforce etc. since these lads has gone back to basic and produced a very melodic affair in the tradition of Axxis, Scanner, (early) Pretty Maids, and even some of the speedy work by Blind Guardian/Helloween. Add to this crystal clear and high soaring vocals and not to mention flashy guitar work by the two six-string benders (Dirk and Steven) and you're in for a small melodic metal treat. I'm however not too keen on the rather typical galloping German Power Metal tunes as of lately. Mostly speaking of "Demon Legions" and "Through The Dead Lands", since both are sadly the major deja vú experience. The clichés are furiously flying across the room as you pick up the occasional lyric of ancient gates, hellfire, and any old fantasy role playing game really. Final verdict: The pure melodic tracks are top notch. The galloping ones are not. Overall not bad at all.